Get a chance to be featured in the exclusive exhibition in New York. MobiTog and FX Photo Studio have joined forces to the International iPhoneography Show, a special event for all iPhone and iPad photographers, professionals and amateurs alike, that will take place in New York on December 16-22, 2011. 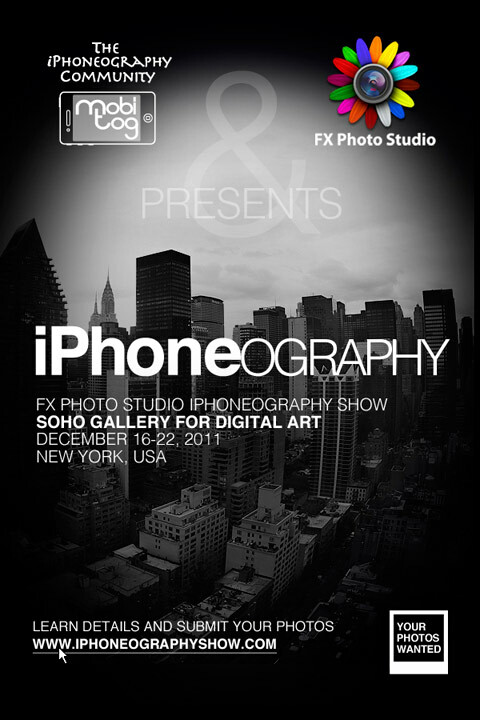 To take part in the International iPhoneography Show, the payment of an entry fee is not required. Photographers can submit as many photos as they like through the International iPhoneography Show official web page on Tumblr. As weird as it may sound, submitted photos don’t have to be taken with an iOS device, but they must be edited in FX Photo Studio (which means, owning a copy of the app, either for iPhone or for iPad, is mandatory to submit). The deadline for submissions is December 10, 2011. All submitted images will be published on the International iPhoneography Show web page. The 100 photos that will deemed the best among them will be featured in the New York exhibition at the Soho Gallery for Digital Art. Winners will also get a few extras — iPhone/iPad photography gear, software and more. If you want to know more about how to submit and prizes or if you simply want to take a look at the photos submitted thus far, please visit the official event’s website. It doesn’t just sound weird, it actually seems wrong that an event with such an all-encompassing, definitive name as The iPhoneography Show is actually completely the opposite. I agree with the previous comment. For instance, you take a photo on your uber-professional Nikon D3, you slightly tweak it on the iPad with FX Photo Studio and you send it to the site for evaluation: I mean really? What’s the point? What’s the creative value given the context? Shouldn’t iPhoneography stand for iPhone (iPad too) photography only? Outrageous! It should be called The Appotography Show instead! Common people. This is called iPhoneography Show, cuz we adress people who use iOS device to create images. The name is not only about the rules, but first of all about the people who are welcome to take part in the contest. We are now getting over 300 submissions daily and most of them were created with iOS apps on iOS device. You can see the submissions here: http://www.iphoneographyshow.com. Anyways, the best camera is the one you have in your hands and the best thing is simply submit an image and see if it gets featured. I bet that most of the people who commented here have not send their works yet. Be positive. But well, just to stop the discussion and motivate you to submit the shots, I have just changed the rules – only iPhone photos (or taken with a mobile device) are accepted. Bring them on! On the site, it says iPad is OK too. As long as it is mobile you can get in. This makes no sense. Not all people have the latest iPhone either and I suppose they are not planning this show to print posters with those photos. iPad 2 has a more than acceptable resolution. You should worry more about choosing a photo they will like than about resolution. Good to know that you listen to your users’ concerns! If I manage to take a photo I like enough before the deadline (not fond of the idea to submit an older photo), I will be more than happy to submit!